Cholera vibrio, kidney failure, acute gastroenteritis. 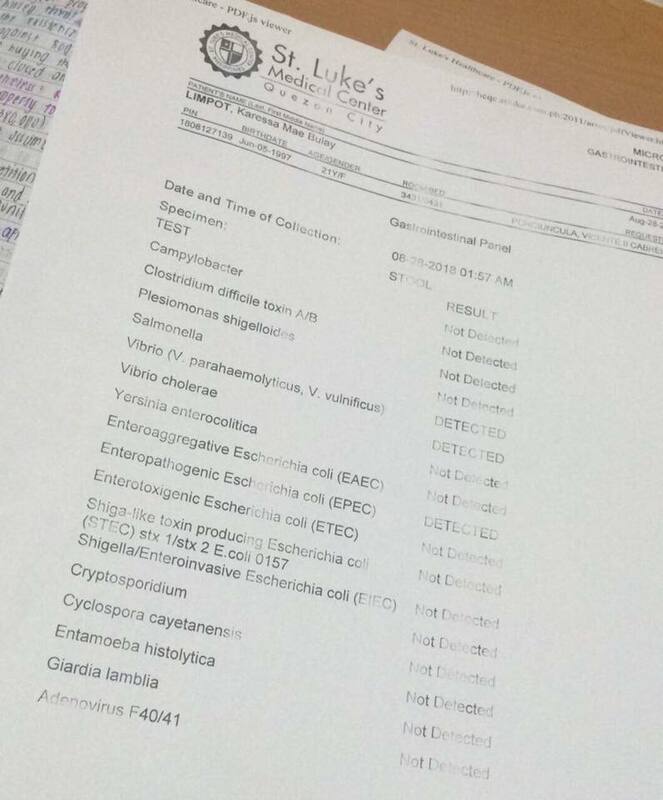 These are the diagnoses of the doctors who attended to a family who dined at Chef Laudico Guevarra’s, a buffet restaurant in San Juan on Aug. 19. Karessa Mae Bulay Limpot took to Facebook on Aug. 30 to call out the restaurant after her family got hospitalized. “Hindi po ito basta-bastang sakit lang sa tiyan. My dad and sister’s kidneys have shut down. My dad has to undergo dialysis twice,” she writes on a Facebook post. According to Limpot, five families reached out and told her that they’ve “experienced the same problems” after dining on the same day as her family did. “Actually, more and more families who dined on the same day have reached out to me. They are armed with their receipts and medical records,” she writes. How did the restaurant respond to their situation? “All we heard was just mere ‘false assurances,’” Limpot says. Three days after Limpot posted her complaint, San Juan City Mayor Guia Gomez ordered an investigation and ordered city health officer chief Jesus Esteban and city environment and natural resources head Dante Santiago to inspect the food and facilities of the restaurant. She also ordered Guevarra’s temporary closure. On Sep. 4, the day the closure started, Guevarra’s published an official statement on Facebook. The management writes that when their customers relayed the incident to them, they immediately initiated an investigation, and the Department of Health and other third-party companies checked the “overall sanitary soundness” of the establishment. After its temporary closure, the San Juan local government has already cleared the restaurant to operate. The Health Department Sanitation Division has also given them a highly satisfactory rating. Cholera is a diarrheal illness caused by infection of the intestine with the bacteria vibrio cholerae. According to the US’ Centers for Disease Control and Prevention, the bacteria is usually found in water or food sources contaminated by feces from a person infected with cholera. It also spreads in places with inadequate water treatment, and poor sanitation and hygiene. Kidney failure in gastroenteritis, on the other hand, is an abrupt decrease in kidney function, making the organ lose its ability to filter water and waste from the blood. Limpot’s dad and sister may have experienced an acute decrease in blood circulating in their systems related to massive fluid loss due to diarrhea and vomiting as well as infection.